19 April 2013 Walking in LA this weekend! 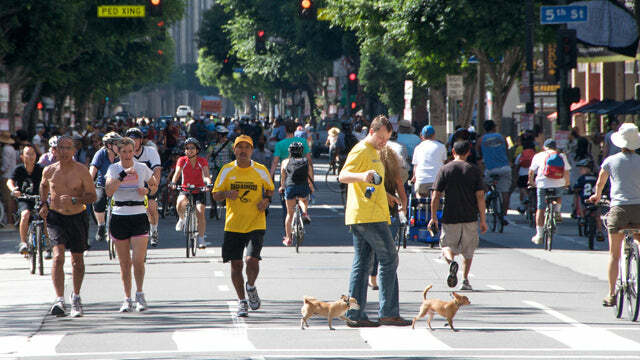 CicLAvia is this Sunday, April 21! Join us and 100,000+ fellow Angelenos going from Downtown to Dogtown! We've been avid "urban hikers" (aka walkers) since our '90s, NYC days...And for the past decade we've been traversing LA on foot daily. Not because of any particular goals or values - we just love the adventure and discovery of exploring a city on foot. And, contrary to popular belief, Los Angeles is a fabulous walking city. There are so many distinct neighborhoods, packed with cool architecture, gorgeous plants, fun businesses and interesting people...It's much easier to enjoy wherever you are in LA outside of a car. This is why we love CicLAvia - one amazing organization that clears specific streets of Los Angeles from all motor vehicle traffic so that residents can really enjoy their city on foot, bike, skateboard...Anything that doesn't have a motor. CicLAvia events are hugely popular and a totally unique way to experience our hometown. This Sunday, April 21, CicLAvia has arranged for major thoroughfares from downtown to Venice to be car free from 10 am-3 pm - an incredible route that's aptly been dubbed "Downtown to Dogtown." Will we walk the entire route? Or just downtown to midtown? Or midtown to the sea? We have no set plans about how much of the route we'll cover, we're just looking forward to enjoying Los Angeles on foot with friends, food and a feisty little dog. If you are in LA, we hope you'll join us and your fellow Angelenos on this crazy adventure!